Yep, you read the title correctly, the ramen noodles in this vegan soup are gluten-free, although you’d never know it. They’re just as wonderfully chewy as the kind made with flour, and they didn’t get mushy, even after sitting in the broth for an hour. 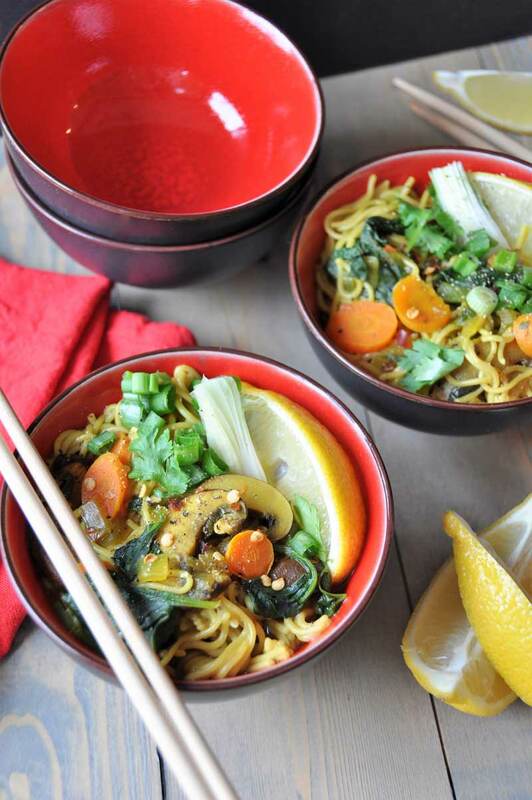 This ramen noodle soup is definitely one of the best I’ve ever eaten, because it’s filled with healthy ingredients, and the flavors of the spices and vegetables marry into a spicy and rich bowl of gourmet goodness. This isn’t the ramen you remember from childhood. It’s been years since I made ramen noodles, and embarrassingly enough, they were the kind that came in a cellophane package with powdered ingredients. They were too salty and had zero nutritional value. Sad. So when I saw a package of gluten-free ramen at Costco, I couldn’t resist buying them, because I love noodles, and I wanted to create a healthy ramen soup that was wow worthy, unlike the prepared stuff. You’re going to love this soup for a few reasons. First, it’s simple and fast to make. All you need to do is dice a few vegetables, sauté an onion, toast the spices, and bring the vegetable broth and veggies to a boil, then simmer them for fifteen minutes. Add the ramen noodles and cook for three minutes, and voila! Dinner is served. A dinner that’s filled with anti-inflammatory ingredients, such as fresh ginger and ground turmeric, and antioxidant and vitamin filled spinach, carrots, mushrooms, onion, and cilantro. The ramen noodles are made with organic millet and brown rice, which means that you’ll find fiber and protein in every bite. This is a balanced one pot meal that you can feel good about eating. This year my mission is to help you eat healthier, while making your life easier, like I did with this recipe. Busy people don’t have a lot of time to spend in the kitchen, so they often resort to eating prepared food or going through a drive thru. That’s not good for your body or your bank account, so let’s start the year off NOT doing that. Sound good? 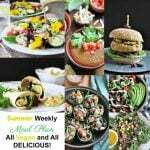 On Friday, I’m going to share a meal plan that you can follow next week. It will have a shopping list (you can shop this weekend), a menu, and some other fun things for you. I truly believe that if you have a plan, can prep ahead of time, and get into the habit of cooking at home, you’re going to see some pretty amazing things happen to your life. 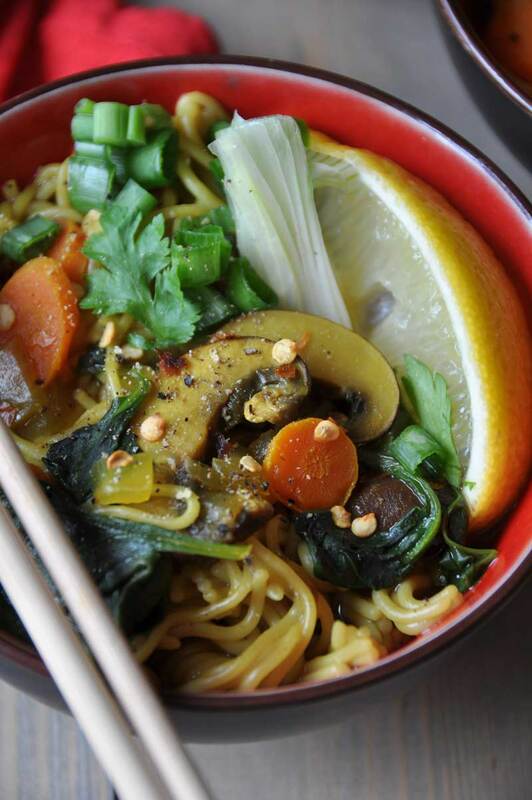 In the meantime, whip up this homemade ramen noodle recipe and let me know how you like it. 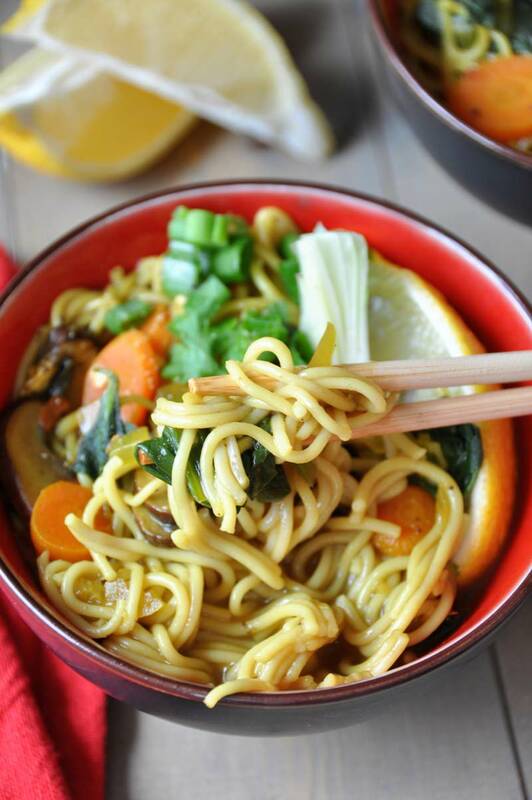 A healthy vegan and gluten-free ramen noodle soup that's filled with vegetables and flavor. Heat three tablespoons of the vegetable broth on medium heat. When the broth is boiling add the onion and sauté until translucent, stir often. Approximately 5 minutes. Add the garlic, ginger, turmeric, cumin, salt, and pepper and stir constantly for thirty seconds. Add the remaining vegetable broth and bring to a boil. Add the lemon juice, carrots and mushrooms and reduce the heat to simmer. Simmer for fifteen minutes then add the ramen, spinach, and cilantro. Cook for three minutes and use a fork to separate the ramen noodles. Use a ladle to put the ramen soup into bowls and garnish with the scallions and crushed red pepper if desired. 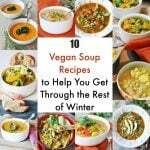 This looks wonderful, I am such a fan of any form of noodle soup - especially for the winter. Thanks! How many servings in this recipe? It says one cup does that mean only one serving? Hi Patricia! It yields 4 to 5 cups, 1 cup per serving.